Update 1: The deactivated page is back. According to an email received by the page admin, “After reviewing your situation, we have reinstated the page, and you should now be able to see it online.” a facebook representative said. Screenshot of the deactivated Facebook page – from Google Cache. The page administrator utilized the page to post updates on the flow of the case before the court and relevant information related to the incident that happened on the 6th of June 2010, as well as mobilizing people to join peaceful assemblies that took place against torture in Egypt and supporting victims of violence. 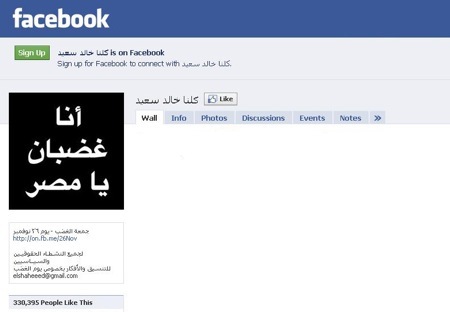 Facebook blocked the largest fan page defending human rights in Egypt. The ugly side of censorship! It’s worth to mention that in August 2009, a Kuwaiti newspaper published a story on a new security department to monitor Facebook in Egypt. It’s still not clear why the Facebook administration took this sudden step and whether there was any consultation that took place with the Egyptian company Connect Ads, the Facebook.com official representative for Middle East and North Africa. The latest event on the page was inviting people to join the “Angry Friday” that will take place tomorrow, Friday 26 November, to support victims of torture and violence.